The author of Joshua is not clearly identified, but Josh. 24:26 seems to indicate it was Joshua himself. It covers a 25 year period and describes the conquest and settlement of Canaan by the Israelites under the leadership of Joshua and by the power of God. The three most important people in this book are Joshua, Caleb and Rahab. 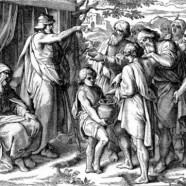 Joshua 2 – Joshua decides to send spies across the river to scope out the area, especially Jericho. Who do they stay with? (vs 2 – a prostitute named Rahab) The king of Jericho finds out about the spies and sends a message to Rahab. Where were the spies actually located? (on her roof hidden under stalks of flax) The king’s men ran out of the city in pursuit and the gates were shut. What did the spies give her and what was she to do with it? (2:17-20. A scarlet cord. She was to get all of her family into her house and let the cord out of the window, indicating where they were. Those who left the house would die, but all who stayed with her would be protected. If she told the king about them, they would be released from their promise.) As soon as the spies left, Rahab tied the cord to the window, though it will be some time before the Israelites conquer Jericho. Why do you think the phrase “be strong and courageous is repeated 4 times in this chapter (it was also in the book of Deut.)? (possible answers: The Israelites are going to war. They have reason to fear because of the giants and walled cities of Canaan. However, they are not to fear because God has promised to be with them. The people and Joshua need God’s encouragement as they embark on the conquest.) When the spies come to Jericho to look it over, they somehow come into contact with a woman named Rahab. We are not told how these men meet up with her, but we do see possibly why. It lies in her attitude towards the people of Israel. Review the things that she says about God and the people of God in 2:10-11. The works of God are known to the king of Jericho and the other inhabitants as well. How is Rahab’s attitude different than theirs? (possible answers: she takes the stories seriously. She believes that she is going to die unless she turns to God. She has faith in the one true God and places her life into the hands of the spies.) Look up Mt. 1:5, Heb. 11:31 and James 2:25. What do these passages reveal to us about Rahab? (She marries Salmon – possibly one of the spies – and becomes the great grandmother of David and as such is an ancestor of Jesus. Her faith in God was evidenced by her aiding the spies and keeping them from the king.) God honors Rahab in several ways for her faith. She becomes part of the line of Christ and her courage and faith are mentioned in both the Old and New Testaments. So, was it okay that Rahab lied to the king’s men when they came? Isn’t lying prohibited by the 10 Commandments? The king was asking Rahab to turn over the spies and if she trusted in God she could not do this. It would be a breach of her faith. God commends her for saving the spies. How can we condemn her? Peter and John do not obey the priests when they are told to stop telling about Jesus. In the same way, Rahab refuses to give over the spies. We may not understand every part of this story, but we do know it is a beautiful picture of grace. This pagan, sinful woman becomes part of Jesus’ family both literally and spiritually. And she in turn goes to her family and helps save them as well. Are we reaching out to our family as Rahab did? Do you have unsaved family members? Then you need to be telling them about the love and salvation that Jesus gives, just like Rahab told her family about the scarlet thread. They each had to believe as well. If they weren’t in the room with Rahab when the walls fall, they will perish. Pray for family members today – that they would come to Christ. Pray that you could be a Rahab to them. The area of the Promised Land that is described in Joshua 1:4 is not the area conquered by Joshua or is it all in the part that Solomon controlled later at the height of the Jewish Empire. Israel never has occupied the all of the Promised Land that God gave them. What is God’s plan for Israel? Are there some things that God won’t make good on in the Abrahamic Covenant because of their sin? Read Romans 11 and give a summary on how God will deal with the nation of Israel. Rahab humbled herself and turned to God. She also was concerned about her family. Do you have a Rahab-like faith and concern for your family? God honored her faith and saved her whole family. Are you concerned about the spiritual walk of your family members? How do you serve them and show them God’s love? Give 5 ways that you can grow in your love for your family. Are all of them believers? Remember, God honors the faith and concern for the salvation of our families. Discuss your relationship with your family, tell how you love them and end by giving the list of the ways you purpose to grow in your love for them.